A minimal addon for taking achievement screenshots. 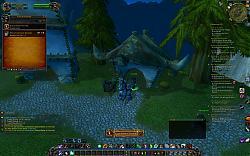 Updated addon for Mists of Pandaria. - Fixed an issue with the timer, which was freezing the whole UI. The folder name inside the zip of v7.0.3 doesn't match the .toc file name, if you don't change the folder name while installing it manually it wont work or show up at all. I was wondering why it didn't work when I installed it via minion, until I realized the aforementíoned problem.